Your private driver anytime @ ₹ 99/hr. Pay by the minute after the first hour. ( ₹1.65/- per minute after the first hour). One-way charges of ₹50 + ₹5/km after 5 kms, upto ₹150. Your private driver anytime @ ₹899 for 12hrs. A flat fee of ₹150 as Night Charges is levied, if you end your drive between 10PM and 6AM. ₹1200/ 12hr (up to 200km). Additional charges after the base (200km, 12hrs) are ₹6/km and ₹99/hr. Food and accommodation to be provided by the customer if trip exceeds 12hrs. 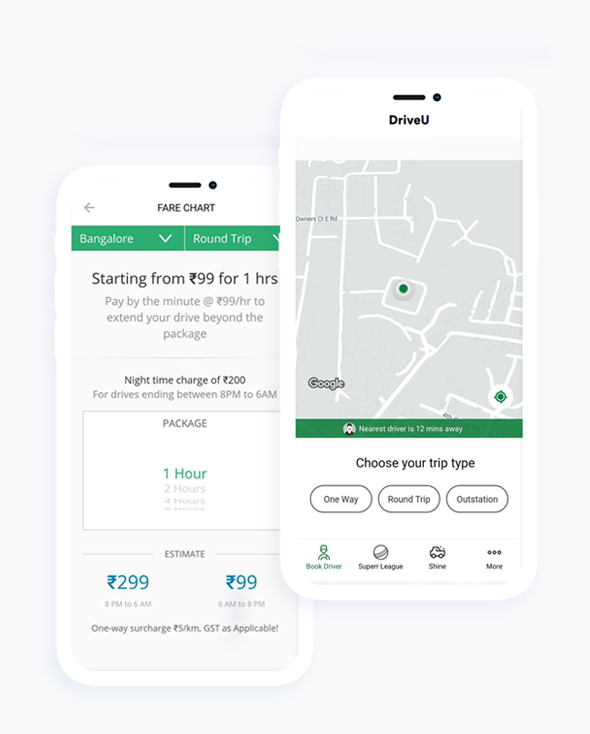 You can now book drivers using packages of 4, 6, 8, 10 and 12 hrs duration at preset prices, at up to 20% lower than our “à la carte” pricing of ₹99/hr. Flat fare for 2 hours! Flat fare for 4 hours! Flat fare for 6 hours! Flat fare for 8 hours! Flat fare for 12 hours! • A flat fee of ₹200 as Night Charges is levied, if you end your drive between 10PM and 6AM. • If your drive extends beyond the selected package time, you will be charged at ₹1.65/minute. • All packages are round trips, and there is a surcharge of ₹5/km if the trip is ended as a one-way trip. • Tolls and any other charges are to be borne by customer.